at 7.30 p.m. A good turnout of members is requested. Reports and agenda listed below. The A.G.M. of the R.E.I.A. will take place on Tuesday 14th April in the Crieff Hotel at 7.30 p.m. A good turnout of members is requested. Reports and agenda listed below. 3. Minutes Of 2014 A.G.M. 30/03/2015 Chairman’s And Secretary's Joint Report 2015. Dear members, 2014 came and went on the Earn with much of it wallowing in the doldrums. Catches were poor over the whole of the U.K. so we can take comfort in the fact that some rivers appeared to be worse of than ours, if that is any consolation! Again we suffered a dry autumn which of course is never good for our prospects. Once more we would like to take the opportunity to thank all members for their continued support to the Association. The committee continue to put in an excellent effort and have given up considerable time on a voluntary basis at a time when business is bouncing back and much more personal effort is expected elsewhere. We perform juggling acts every year with our time but much more so for the last 2 years. Hopefully though, if the collective effort results in long term improvements, then it will all have been worthwhile. Firstly, and probably most importantly, our fishing returns suffered as a result of various bouts of somewhat inclement weather. The spring was quite kind to us in many ways. February was quite quiet overall with odd pods of fish arriving from mid March through to mid May particularly in the middle beats around Kinkell. Nothing startling, but certainly bucking the national trend and an Earn springer remains a prize worth working for. Unfortunately, then it all went wrong for different reasons to 2013. Last season (2013) we suffered with floods of biblical proportions throughout the back end which meant we struggled both for Sea Trout and Salmon as the river ebbed and flowed and never settled. 2014 was a total contrast with drought all through the autumn period until virtually the last week of the season so little wonder our river, so dependant on rain, suffered poor catches. Every beat struggled to put numbers on the score sheet but overall a very respectable catch total of 531 (748) salmon and 550 (302) sea trout were landed with C&R on both species hovering around the 89% mark. Well done again! It is interesting to note that many rivers reported an upsurge in sea trout numbers last year and the Earn was no different with over 200 fish landed against the year previous. Hopefully this season the weather will be kinder than the past 2 seasons which will allow us all to see exactly if there is a natural decline in salmon numbers or if we can all look forward to better days to come. Best I can do on this subject is repeat what was said at the last A.G.M. Nothing has changed, I get no reports of angling success and less photos. I continue to add what I can to the website but unfortunately, all the photographs and reports dried up with the drought around June as a result of the weather. Hopefully this season will bring better conditions and a resultant improvement in catches and photo intake. Please send as many photos of interest to the link on the website www.riverearn.org.uk and I will include them on the gallery. Any interesting anecdotes are welcome also, I need help to keep it fresh and current. PayPal and Direct Debit are now acceptable methods of payment of subs along with Credit and Debit cards as well as the old reliable cheque by snail mail. Our major project expenditure is starting to bear fruit and our team of volunteers have been out and about during the past year clearing windblown and blockages from our spawning burns in an attempt to ease the passage of salmon and sea trout upstream migrations. We have carried out such works on the Glaschorrie Burn in the Upper catchment, Leannoch burn (Strowan) , the Machany, Castle and Milton burns. The bit is now firmly between the teeth of the team and they are to be applauded and complemented for their ongoing efforts. Photos are available to view on the Conservation page of the website. Thanks to Derek Trevis, John Young, Jim Perritt and Ian Pollock for taking the time and effort to take the qualifications and for their future efforts. We continue to invest in Invasives Spraying and hope this will continue for a number of years yet. These projects are jointly funded by the Tay Board Although we are not sure if any further funding will be forthcoming at this moment in time. We have not been able to enter any meaningful discussions with the National Park very much due to availability of time required to coordinate approaches and projects. The N.P. continues to be responsible for invasive spraying in their area and continue to do so. The Chairman and Treasurer of the Association have been particularly active in promoting our concerns relating to the siting of the event at Strathallan Castle. The Chairman attended meetings both in local halls and with the promoters and their P.R. representatives and has secured a number of concessions relating to the protection of the Machany and feeder burns within the Estate grounds. Colin will expand now. Directly as a result of the kelt reconditioning programme , we are delighted to report that some 30000+ fry were introduced into the Ruchill system last season. We continue to push for much more and will keep the pressure very much on in this respect. This did not take place due to lack of entries received. We continue to incur heavy postage costs relating to members who do not advise their email addresses. If you have not already done so, please advise at your earliest via the link on the website. Please encourage all who use the river to invest in a membership of our Association , the more income we can generate, the more improvements can be carried out on the river. It’s a very simple equation, really. Thank you, Colin Lowson. Chairman R.E.I.A. Tom Monaghan. Secretary R.E.I.A. The A.G.M. of the R.E.I.A. will take place on Tuesday 25th March in the Crieff Hotel at 7.30 p.m. A good turnout of members is requested. Reports and agenda listed below. 3. Minutes Of 2013 A.G.M. Dear members, Another year has come and gone, not the best in recent years but as you are all probably aware, the weather decided to do its worst to us in a number of different areas. We would like to thank all members for their continued support to the Association.The committee have put in an excellent effort and have given up considerable time on a voluntary basis. Special thanks to Duncan Clark who has chaired the Trout Protection Order Liaison Committee for over 10 years and is standing down from his post in order to spend more time fishing. Duncan has already managed to land 2 springers so far this season so his retirement appears to be paying off!! Firstly, and probably most importantly, our fishing returns suffered as a result of various bouts of somewhat inclement weather. The Spring was quite kind to us in many ways. Early results were quite encouraging all the way down the Strath and there is nothing more satisfying in landing a Springer or 2 in a river not particularly known for a spring run. However, for a period during March, April and May the middle beats picked away and whilst the Chairman was away up to the Dee, John Young and the Secretary had a few casts of his rod while he wasn’t looking and of course, we both got off the mark while Colin blanked on the posh water!!!! Kinkell and Trinity Gask also faired well in the Spring with Sandy McIntosh accounting for around 60 till the end of May. Not bad for a wee river not known for a Spring run! Above these beats Crieff “picked away” and Lochlane had a number of lovely fish to which the website gallery testifies. Unfortunately, then it all went pear shaped. Drought in the Summer followed by unceasing and unrelenting rain from September onwards meant that we struggled both for Sea Trout and Salmon for diametrically opposing reasons. However , we all did our bit to keep the catches up and the total returns for the river were a very respectable 748 Salmon and 302 Sea Trout, with an 89% return rate for Salmon. Most commendable indeed. I continue to add what I can to the website but unfortunately, all the photographs and reports dried up with the drought around June as a result of the weather. Hopefully this season will bring better conditions and a resultant improvement in catches and photo intake. Please send as many photos of interest to the link on the website www.riverearn.org.uk and I will include them on the gallery. Any interesting anecdotes are welcome also, I need help to keep it fresh and current. PayPal and Direct Debit are now acceptable methods of payment of subs along with Credit and Debit cards as well as the old reliable cheque by snail mail..
Over the past year we have invested quite heavily in getting our own team of volunteers trained, insured and equipped with chainsaws and P.P.E. to a standard which allows us to deal with tributary blockages as they come along. This assists free passage of migratory fish to the spawning areas and a list of projects has been compiled to create a minimum 5 year plan project list. Ongoing wind blown and other situations will inevitably add to that, but we are now in the strongest position ever to deal with these problems. The horrendous winter weather we have just experienced curtailed our volunteers enthusiasm somewhat as they simply could not get near the burns. A small window of opportunity allowed us some access to the Machany, however, and photos are available to view on the Conservation page of the website. Thanks to Derek Trevis, John Young, Jim Perritt and Ian Pollock for taking the time and effort to take the qualifications and for their future efforts..
We continue to invest in Invasives Spraying and this will continue for a number of years yet. These projects are jointly funded by the Tay Board Although we are not sure if any further funding will be forthcoming at this moment in time. A series of preliminary talks took place between John Young and a National Park Officer but due to pressure on available time, had to be temporarily shelved. Fresh efforts will be made this month to agree acceptable projects for possible grant funding. We now have 31 fish in the kelt reconditioning facility, all taken from areas traditionally known for holding Spring stock. Progeny from these fish have already been planted out in the Upper river. Apart from photographs in the website, John Young has full details and remember, if you would like to visit the facility, please just ask any of the Committee. It was decided last season not to continue with the competition and draw due to the extremely poor conditions. The Committee has decided to revitalise it once more this season , you have all had the details sent to you. Please, get involved and help make it a success. Encourage as many people as possible to join the Association and try and win a prize. Please make sure to have your catch witnessed along with a photo for the Gallery. Good luck to you all. Big Fish Competition. 1. Largest fly caught fish caught by a member.--------Bottle S.L.C. Specially Commissioned Commemorative Whisky. 2. Largest fish caught by a member.-------- Bottle S.L.C. Specially Commissioned Commemorative Sloe Gin. 3. Largest fish caught by a junior member.--------------£25 tackle voucher. Sea Trout Competition. 1. Largest fly caught sea trout caught by a member-----Bottle finest malt whisky. 2. Largest sea trout caught using any method by a member-----Bottle finest malt whisky. 2. One day salmon fishing Innerpeffray for one rod. Kindly donated by Colin Lowson. 3. One day salmon fishing Kinkell for one rod. Fly Only. Kindly donated by Ian Dalglish. 4. One day salmon fishing for one rod Auchterarder A.C. beat. This prize reserved for NEW individual members registered this season only. Kindly donated by Auchterarder A.C.
5. One day salmon fishing for one rod Crieff A.C. beat. Kindly donated by Crieff A.C.
6. One day salmon fishing for one rod Dunning A.C. beat. Fly Only. Kindly donated by Dunning A.C.
7. One day ghillied salmon fishing for one rod at Trinity Gask beat. Kindly donated by Drew McIntyre and the syndicate members. 8. One day ghillied salmon fishing for one rod at Lochlane & Laggan beat. Kindly donated by John Young and the syndicate members. Rules Of Entry. 1. Entrants must be registered individual members of the Association as at 30th June 2013. All such members will be automatically entered to the prize draw. 2. All fish entered to the competition must be witnessed, photographed and confirmed as being returned alive to the river. 3. The decision of the Committee will be deemed final at all times. 4. On confirmation as a prize winner, contact details will be forwarded so that the necessary arrangements may be made with the donor. 5. Winners of the draw may choose their preferred prize in the order they are drawn . First out the hat chooses first and so on. 6. For details of the work of the Association and how to register as a member, see R.E.I.A. The A.G.M. of the R.E.I.A. will take place on Tuesday 19th March in the Crieff Hotel at 7.30 p.m. For full details click A.G.M. I have received the following message again tinged with sadness of the passing of another Earn stalwart , Deryck Payne. We would like to pass on condolences to family and friends from all who knew Deryck Payne from Dunning. Deryck was a popular fisher fishing Dunning AC,Findo Gask and Upper Aberuthven. Deryck had his own tree surgeons business until last October he suffered a stroke which ended with Deryck losing mobility placing him in a. wheelchair. Still with all his faculties. The Dunning AC made Deryck a casting platform which he had been using in August. Recently Deryck had been taking into St.Magarets in Auchterarder after losing a lot of weight to help him convalesce and assist his recovery. Derek Trevis took the call from his wife saying she had lost him yesterday morning. Deryck will always be remembered for his generiosty,giving hatchery workers free fishing on his week on the Tay. Deryck was always up for a laugh and would be always remembered for his dry wit. Our thoughts are with his family at this sad time. 1. Largest fly caught fish caught by a member.--------Bottle S.L.C. Specially Commissioned Commemorative Whisky. 1. 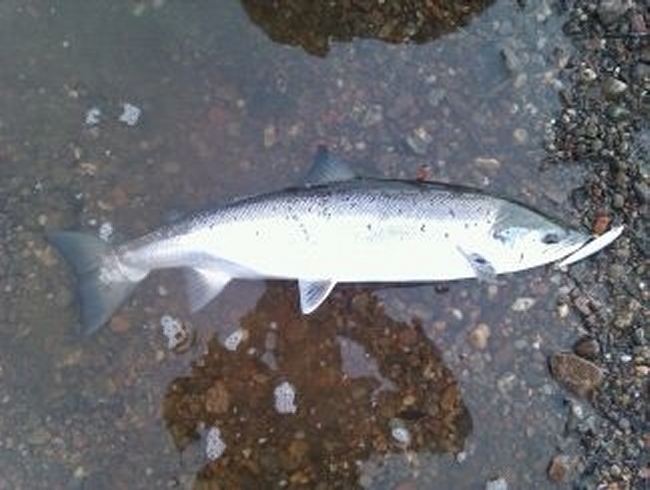 Largest fly caught sea trout caught by a member-----Bottle finest malt whisky. Kindly donated by Auld Greenheart Johnston himself. 2. Largest any method caught sea trout caught by a member-----Bottle finest malt whisky. Remember---you have to be in it to win it!!!!! Again, very many thanks go to those who contributed prizes. 1. Mr P.R.Welling -----A days fishing at Dupplin. 2. Prof. Olivia Robinson -----A ghillied day at Trinity Gask. 3. Mr. John Gillies -----A day at Kinkell. 5. Mr A.Novell -----A day at Crieff A.C.
6. Mr Peedle -----A day at Crieff A.C.
7. Mr Tony Harris -----A day at Auchterarder A.C. In addition to the above , Mr A.N.French , who is based in London , declined a prize , for which we thank him. We wish all the winners every success on their chosen days and we hope to see some smiling faces along with some not so smiling fish on the Gallery soon. Very many thanks go to those who contributed prizes. A continuing feature of angling on the Earn nowadays is the seemingly incessant encroachment on the riverbank of Invasive species such as Himalayan Balsam and Japanese Knotweed which , if left to spread unhindered , effectively destroy other bankside vegetation and , because their root systems are generally shallow , destabilise the integrity of the soil and make it much easier for floods to erode and wash it away. The R.E.I.A. will not stand back and allow this to happen and are to invest up to £4000 in bankside spraying over the next few weeks. Spraying is esential as it is the only effective means of control and management of these insidious plants. It is with great sadness that I report the death of Bill Jack today. Bill was a tireless worker on the river, always striving to do his bit to improve the fishings and help fellow anglers . 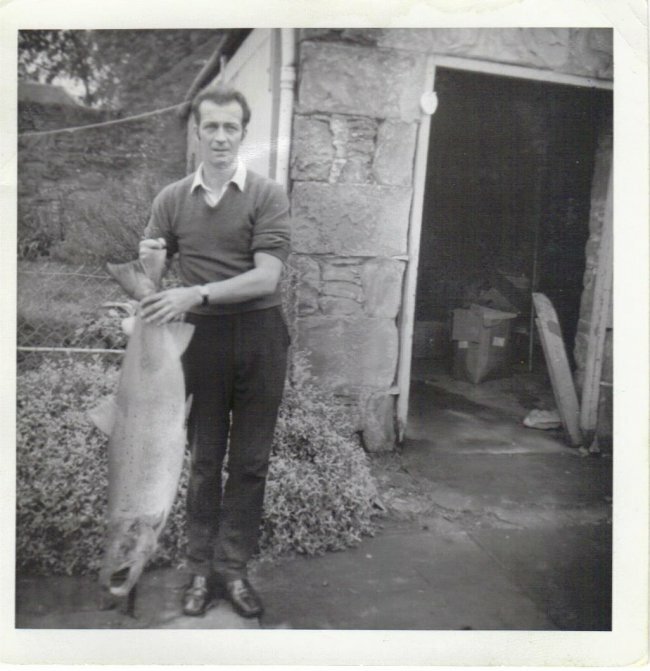 One of his great passions was assisting John Young at Balloch hatchery, most often in the company of his great friend, the Late George Dudek , who also sadly passed away recently. Auchterarder will be the poorer for the passing of these two great friends and characters. I received the following message from Derek Trevis , Chairman of Auchterarder A.C. and close friend of both Bill and George. "Auchterarder's Legendary Bill Jack Passed Away Today. I received the sad news of Bill Jack passing away this morning. Bill had been suffering with prostrate cancer,and his passing being sad was a blessing in disguise. As Chairman of the club I would like to pass on our condolences to friends and family. A mention must go to Jock Hally who has lost a very special friend,fishing together for over 50 years,joined at the hip.Our thoughts are with you Jock." Bill With a 33lbr caught in the Mount Stream. An intrepid bunch of Committee and Member Volunteers led by John Young have been busy tending the garden at Ferryfield netting station on the Lower River , thus maintaining good public relations between the owner and the R.E.I.A. This token gesture helps ensure that , although Ferryfield netting rights are not owned by the Association , they are highly unlikely ever to be exercised again. Thanks go to John Young and Lee Fisher (Tay Bailliff) for organising and taking part along with Landscaper extraordinaire Bob Mitchell , Jim (The Fish) Fisher and Drew McIntyre for their efforts in ensuring our river remains net - free. Apologies – R.Pearmund, P McDonald, M. Aldridge, C.Millar, T. Harris, M.Morgan, M.Melville. Present – 18 members. 1. Chairman's Welcome.Colin Lowson welcomed the 18 members. 2. Minutes - Minutes from the previous A.G.M, were taken as read and proposed by Tom Monaghan and seconded John Young. 3. Matters arising – Point 8 of the previous minutes. A question was raised on the disused weirs and what updated information did we have? Rob Mitchell T.D.S.F.B. replied as follows; The Cloan Burn has a potential hydro electric scheme in design stage, with the benefit that the new scheme would have a fish pass arrangement unlike the existing. The Ruthven – the existing weir is impassable and costs are being established for demolition of the structure. On a positive note the land owner is supportive of plans to remove the weir. The May has silt build up and tree blockages below the weir but is not identified as priority on the T.D.S.F.B. list. 4. Secretary’s report. Gavin Harrower reported that there had been a better but belated list of catch returns sent back. All bar 1 return itemised the monthly return, 1 only giving their annual return which is highlighted in bold on the 2011 return. A total of 724 salmon, 213 grilse and 731 sea trout were caught with well over 65% returned. 5. Treasurers Report – The income has remained the same for the past year with only 13 new members. Donations are down and Ian Dalglsh has made a big effort to prompt continued support from the existing member base and old members. Expenditure has increased with £1800 being made available for clearance work on the Machany and further equipment purchases for John Young. The current account is still sitting healthy and proposals are sought for river based projects or ideas, where the funds can help. The new membership application form is now available through our web site. Accounts proposed John Young and seconded John Patterson. 6. Chairmans report – Colin Lowson started by giving a brief overview of the Tay board and how they were restructuring by dropping from 24 committee members to just 11 with River Earn representation from John Young. Invasive species – weed control is being trialled on the Earn system with 15 days treatment per annum allocated and funding has been agreed through the Tay Foundation. It’s estimated from our catch records that at least 65% of our fish are being returned, which is commendable. Colin reminded all the catch & release is not mandatory but is to be promoted and encouraged as good practice to all. Web site – Colin complemented Tom Monaghan for his hard work and effort to launch our web site who has agreed to continue building and maintaining. Competition – Colin confirmed that the committee have been preparing a competition for members with prizes ranging from days on various beats to bottles etc to be drawn on a regular basis. It was confirm that 12 days fishing had already been secured as part of the promotion. The board wish to use the R.E.I.A. template on the Tay system to set out improvement measures. Colin Lowson and John Young have agreed to meet Bill Jack and David Summers twice a year. Try to collate as much information as possible electronically. In the event of the T.D.S.F.B. taking over the hatchery they would like to welcome anyone interested to view their set up and the kelt reconditioning programme. Potentially, a tank is being made available to hold Earn system fish so that we can further develop our spring stocks and continue to increase our native stocks generally. T.D.S.F.B. will also continue to assist with the control of invasive species, by way of labour and practical advice. Rainbow Trout – DS is looking in to the possibility of DNA testing to identify their source in the event of future escapes. TDSFB are actively monitoring gravel movement on the Ruchil at the confluence with the Earn in Comrie. TDSFB are planning to carry out a week’s electro fishing during July or August as part of the brood stocking programme. The Balloch Hatchery – Do the REIA continue using the hatchery and concentrate on sea Trout as the core brood stock species? 7. Election of Office Bearers. Colin Lowson to remain as Chairman, Ian Dalglish to remain as treasurer, Gavin Harrower is stepping down as secretary to be replaced by Tom Monaghan, proposed by D.Trevis and seconded B.Mitchell. 8. A.O.C.B. J Patterson asked if one club had opted out of the invasive species scheme, namely Dunning AC, but it was pointed out that they were taking the initiative by carrying out their own control measures. R Mitchell also highlighted that the TDSFB were actively working up as far as the Dalreoch Bridge and to notify the club to avoid any possible duplication. JPerret asked if there had been any significant discussion about beavers and the potential damage they can do the river bank, intimating at the same time, that the Scottish Government has called for a monitorium on Tay Beavers until the Knapdale trial is complete. John Young requested that he be notified of any dams or structures appearing on the Earn system that relate directly to beaver activity. J Patterson introduced Gordon Taylor as the new Crieff Angling Club secretary. S McIntosh raised a point about a third party wishing to set up web cams and establish dialogue through forums. This point was deferred till the next committee meeting at Kinkell. T Monaghan – asked if there were any proposals to ease the blockage at the Falls of Ness and what information did we have on the historic proposal of blasting? Various comments and opinions were offered but nothing definite. Paul Turek feels that the REIA need to build up their overall profile to encourage support and better attendance. I Dalglish asked G Taylor of Crieff A.C. if there was any possible scope for using CAC as a way of promoting the R.E.I.A. directly to the member rods to raise profile and hopefully increase membership. The same question was asked of Comrie and G Harrower has been asked to approach the club. C Lowson – felt that we could make better use of the local newspapers like the Herald, Strathearn News, Strathearn Quair , Perthshire Advertiser and Courier as promotional aid. The meeting was closed with thanks and the date for the next A.G.M. and committee meetings would be posted on the web site. 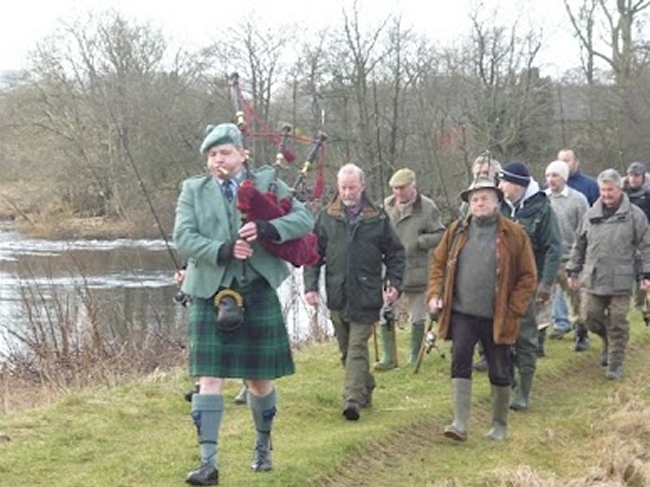 The Annual General Meeting of the River Earn Improvement Association, will take place in the function suite of the Crieff Hotel, East High Street, Crieff on Thursday 22nd March 2012, 7.30 pm. Reports and agenda listed below. 2011 initially saw extremely low temperatures and significant snow which resulted in large numbers of unspawned fish being caught in the first few weeks. Hopefully these fish did spawn successfully when water temperatures finally rose. Catch numbers of salmon were down slightly on 2010 at around 1,000 (1,170) with sea trout numbers up significantly at around 750 (500). High water played a huge part in the later months of the year as the rain never stopped. The Tay Board has been reduced in numbers to 11 and a meeting with members of the Association will take place shortly before the AGM with Bill Jack (Chairman), David Summers and Rob Mitchell. A closer working relationship has been achieved with Rob Mitchell attending all our meetings and carrying out work on the river. John Young has been re-elected to the Tay Board for his great knowledge and he continues to put a huge amount of work into the Earn. TDSFB have agreed an ongoing programme over the next 2 years to try and control Japanese knotweed with over 30 days of spraying over the last two years providing good progress. This is being undertaken from the top of the river down to minimise transmission. Each area that is sprayed must be left for a period of 24 months before a second visit can be carried out. It is suggested that the best method of dealing with Himalayan Balsam is to strim the plant before the seed pods have formed up. The intention is to secure spring fish for the Almondbank Hatchery and undertake a kelt-reconditioning programme to try and produce spring eggs. Secondly, this would provide genetic integrity if any disaster was to unfold on the natural stock. Reconditioned kelts can produce eggs for a number of years and hopefully this could provide assistance to increase spring numbers. The future of the river is dependent on anglers’ efforts to adhere to the Tay code. Springers should be returned carefully to the river as they are a scarce and everyone should encourage all clubs and anglers to adhere the Tay Board Catch & Release policy. This is vital to sustain fish for future generations. Tom Monaghan has put a huge amount of work and time into the site and I would like to thank him for all his help. Please visit the site and use it for all its information and news. I would like to express my thanks to all who have helped with Association work and actual work on the river this year and in the past. Special mention to John Young and Duncan Clark and his team on the Liaison Committee. I look forward to this year’s challenges and enhancing and protecting our very precious resource. Please encourage anyone who fishes the Earn to join the Association. They can, for a very small subscription, provide additional help and participate in the undernoted draw and competition. Open To All Individual Members With Subscription Paid At 31st May 2012. 7	Election of Office Bearers. The returns tell us that overall on the river we are achieving an 80% C&R rate for salmon and grilse, which, if accurate, means we are fast becoming one of the most conservation minded rivers in Scotland and all who contributed to that figure are to be highly commended.. Even more impressive are the figures on sea trout , which reflect a stunning 88% return rate. Absolutely outstanding and well done to all!!!!. Minutes of the A.G.M – Crieff Hotel – 20/4/11. Apologise – R.Pearmund, P McDonald, B.Jack, M.Melville & A.Hamilton. 1. Chairman welcomed the 21 members. 2. Minutes from the previous AGM, read out by J Perrett, proposed by John Young & seconded Gavin Harrower. 3. Matters arising – Item 5 web site. Work on the web site well under way & due for launch in the early summer. Dry suits – costs of the suits discussed in previous meetings had been established & pending a decision to proceed. Deferred to the next committee meeting @ Kinkell. 4. Secretary’s report & catch returns. The 2010 season catch report total was read out as 700 Salmon, 468 Grilse, 422 Sea Trout & 72 Finnock, based on the returns submitted. CL asked if it would be possible to see the catch records over the past 5 years to take an average. 5. Treasurers Report – There is a marked improvement on the accounts from the previous year, particularly from donations with a slight increase in our favour with an improved interest rate. Costs were mainly with depreciation of hatchery equipment & stationary costs. The point was emphasised that we do have cash on account to support any worth-while projects on the river in need of support. M.Morgan – Raised the point the “asset’s” (the netting rights on the lower earn) do not appear on the accounts. ID noted that he would endeavour to show the “assets” on the accounts, how ever there was a problem with the lawyers involved & where the deeds were actually held! A question was raised as to the number of members & confirmed as 100, with the follow up question being how do we increase the membership base? J.Young proposed the accounts & seconded by D.Trevis. 6. Chairman’s report – 2010 season have seen a healthy increase in average fish returns, with some beats recording their best catch records in years, which seemed to be a national trend. The river flows during the season were above average. A water temperature gauge has been successfully fitted @ the SEPA flood monitoring station @ Dalginross, in response to claims that the river temperature was dropping with generation from the Loch. At the time of writing there was no significant effect in the water temperature. How-ever, during September the 4th to 6th there was a variance of 0.5 degree drop in water temperature officially recorded. Machany – tree felling / scrub clearance work is ongoing & a license had been granted by the Forestry Commission. Japanese Knotweed – The TDSFB have obtained a grant from the Esme Fairbairn foundation to control invasive species as part of a national project led by RAFTS. Permission had been gained from a number of proprietors on the Earn & an order placed with a contractor to spray large sections between Crieff & Aberuthven. Evidence of Beaver activity had been seen in the lower reaches around Dunning but not in any significant number. Hatchery. The chairman reported the sad loss of George Dudek who had been supporting the REIA for over 4 years & had made a significant contribution in assisting John Young @ the hatchery on a daily basis. A question was raised as to why the spraying work had started in the mid sections & not the upper reaches. This was mainly due to the sheer size of the project & that access to some area’s had been difficult to confirm with the owner. It had been noted that if the owner was in any way obstructive that the TDSFB could enforce law. 7. Liaison – It had been noted that in accurate information had been circulating through various web sites regarding permit locations & that it was noted it may be worth pursuing Visit Scotland to ensure the correct information is being distributed as well as using our own web site. Duncan Clark intimated that he wished to step down from his position in the near future. 8. Habitat. John Young started by thanking the TDSFB for their support over the season, along with Ian Dalglish, Sandy, Colin Lowson, Aberuchill Est, Fordie Est, Strowan Est, Trinity Gask & Strageath Fisheries & Comrie, Crieff & Auchterarder AA for their generous donations towards the hatchery. During season 2010 JY involved 5 different schools in the process of planting out eggs & eyed ova. The project involved educational support from the Almondbank & Tay Board Hatchery. Thanks were given to Lee Fisher for his assistance. Ongoing habitat works have been carried out in the upper reaches, namely the Glascorrie Burn,Fordie burn & the Machany in the mid section. Last year all clubs/fisheries were asked to carry out surveys along their stretches of river. Comrie was the only club to do this & subsequently work has been carried out by the bailiff’s. In the lower reaches the TDSFB have identified three burns with disused weirs, the Cloan, the Ruthven & the May. Discussions with owners are ongoing. TDSFB has now taken over the government hatchery & therefore it is anticipated there will be changes in the future will be for the better. George Dudek. John paid respects to George, acknowledging his help with the hatchery & that he would be sadly missed. *Identify & grow the membership. *Habitat Improvement. Establish what has been done & identify new areas in need of work & apply pressure to the correct bodies. *Establish a survey network of the river system. * Catch & release. Continue to push & support the TDSFB recommendations. * Predation – Look what we can do effectively to control razor bills, rainbow trout & crayfish. * Education – continue the promotion of what we do through the schools. 10. AOCB. Machany – Sandy had confirmed that the felling license was in place. There had been an attempt to carry out some of the felling work in the spring, but the work was postponed due to the height of the river & health & safety concerns to operatives. In the mean time, the Tay Ghillies have assisted with the scrub clearance work. Paul Tuarek – volunteered to survey the Glascorrie burn on a regular basis & questioned the health & safety aspect of him using his own chain saw to clear blockages. J Perret highlighted that the REIA as a body do not have insurance cover to instruct Paul to carry out this type of work. JP emphasised that all personnel operating saw’s on the river bank must be fully trained. Meeting closed with thanks. Next agm set as the 22nd March 2012. Prize list is growing like Topsy. 4 more fine prizes added , 2 courtesy of Auld Greenheart himself A.K.A. Josler's dad who has insisted we create a new category very close to his not -so-green heart, the mighty Sea Trout. Is'nt it just wonderful that a member and long time Earn angler would feel so strongly about his beloved river and quarry that he would put up 2 fine bottles of malt out of his own pension income. Marvellous gesture from the man himself, Auld Greenheart. 2 great prizes from Drew McIntyre and co. at Trinity Gask. If you haven't fished the river here is an opportunity to fish a fine beat with a knowledgable ghillie who will do his best to put you on to a fish. Thanks also go to Crieff A.C. , Auchterarder A.C. , Bob Mitchell, Colin Lowson and Ian Dalglish for their valuable contributions. What an incentive to join the Association!!!! Send us your £15 and hopefully win a prize. Got to be in it to win it. 1. Largest fly caught fish caught by a member.--------Bottle S.L.C. Specially Commissioned Commemorative Whisky. 2. Largest fish caught by a member.-------- Bottle S.L.C. Specially Commissioned Commemorative Sloe Gin. 3. Largest fish caught by a junior member.--------------£25 tackle voucher. 1. Largest fly caught sea trout caught by a member-----Bottle finest malt whisky. Kindly donated by Auld Greenheart Johnston himself. 1. One day salmon fishing Dupplin Estate for one rod. Fly Only. Kindly donated by Bob Mitchell. 2. One day salmon fishing Innerpeffray for one rod. Kindly donated by Colin Lowson. 3. One day salmon fishing Kinkell for one rod. Kindly donated by Ian Dalglish. 4. 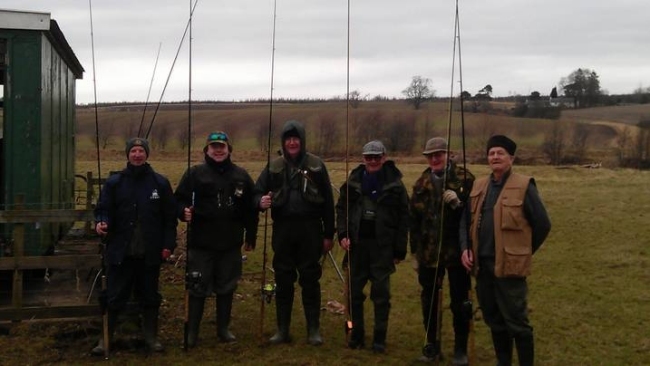 One day salmon fishing for one rod Auchterarder A.C. beat. This prize reserved for NEW individual members registered this season only. Kindly donated by Auchterarder A.C.
5. One day salmon fishing for one rod Crieff A.C. beat. Kindly donated by Crieff A.C.
6. One day salmon fishing for one rod Crieff A.C. beat. Kindly donated by Crieff A.C.
7. One day ghillied salmon fishing for one rod at Trinity Gask beat. Kindly donated by Drew McIntyre and the syndicate members. 8. One day ghillied salmon fishing for one rod at Trinity Gask beat. Kindly donated by Drew McIntyre and the syndicate members. 1. Entrants must be registered individual members of the Association as at 31st May 2012. All such members will be automatically entered to the prize draw. 2. All fish entered to the competition must be witnessed, photographed and confirmed as being returned alive to the river. 3. The decision of the Committee will be deemed final at all times. 4. On confirmation as a prize winner, contact details will be forwarded so that the necessary arrangements may be made with the donor. 5. Winners of the draw may choose their preferred prize in the order they are drawn . First out the hat chooses first and so on. All you need to do is go to the Membership page , download the form and make sure you are registered by 31/5/2012. At £15 you know you should really be doing it, don't you??? 18/02/2012 R.E.I.A. Members Prize Draw 2012. There will also be prizes , currently in negotiation, for the biggest verified fish both for adults and juniors for the season. 07/02/2012 Earn's First Authenticated Springer 2012. Drams All Round By A Mystery Auchtrarder A.C. Angler. We Await His Identity. A 6LB well built bar Of silver. Well done to the reluctant hero whoever he is!!!!! Stop Press.Information just received reveals the captor as none other than Ali Sutherland. Our congratulations go to him. Well done!!! 01/02/2012 Opening Day Season 2012. Opening Day Procession Crieff 2012. Opening Day 2012 For Auchterarder's Hardy Sons. Opening Day 2012 saw several hardy souls brave the bitter cold and low water conditions to enthusiastically wet a line. Bitter cold, low water and bright skies ensured no fresh fish were reported anywhere on the river. Come Along To These Free Events And Find Out More About This Riverside Problem. 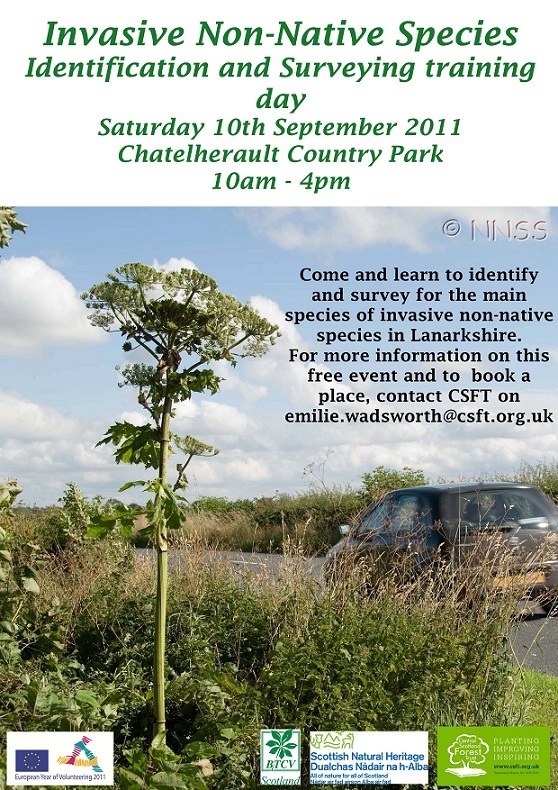 The purpose of the event is to provide some free teaching seminars to educate those who deal with or may encounter invasive non-native species in the course of their work in the Falkirk area, with a particular focus on the invasive species Japanese Knotweed. We will be inviting professionals from the construction industry, utilities, land management, university and agricultural college students, employees and managers from Falkirk Council services and the like. We are in process now of finalising our speaker times and topics and setting up our on-line registration process. Within the next two weeks we will send you more details, including an email poster for you to circulate to your cohorts, and advance registration information for the classes. Meanwhile, feel free to contact us to tentatively reserve your space, and forward us any email addresses for those you feel would be interested in an invitation to this FREE DAY OF INVASIVE SPECIES AWARENESS TRAINING. Class registrations will be based on limited numbers, on a first come first served basis. 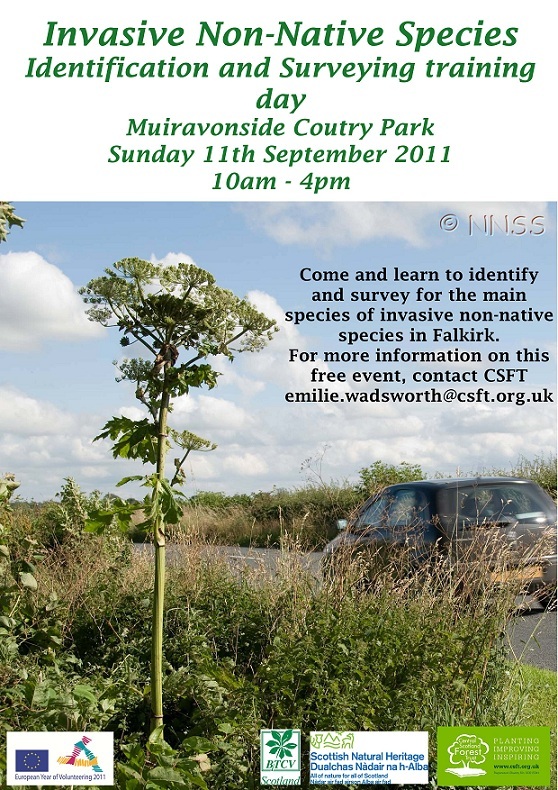 for Falkirk Invasive Species Forum and Communities Along the Carron Association. This event is being funded by Falkirk Environment Trust and Falkirk Council Development Services. Look out! Tagged salmon about Adult salmon are being tagged in the estuary of the river Tay in autumn 2011. This will provide information on the behaviour and numbers of autumn salmon entering the river Tay which is essential for the good management of the fishery. If you catch a tagged salmon please note the tag number and report it to the Tay foundation or TDSFB on 01738 583733. If you can, we would be most grateful if the fish could be released to see if it gets caught again. 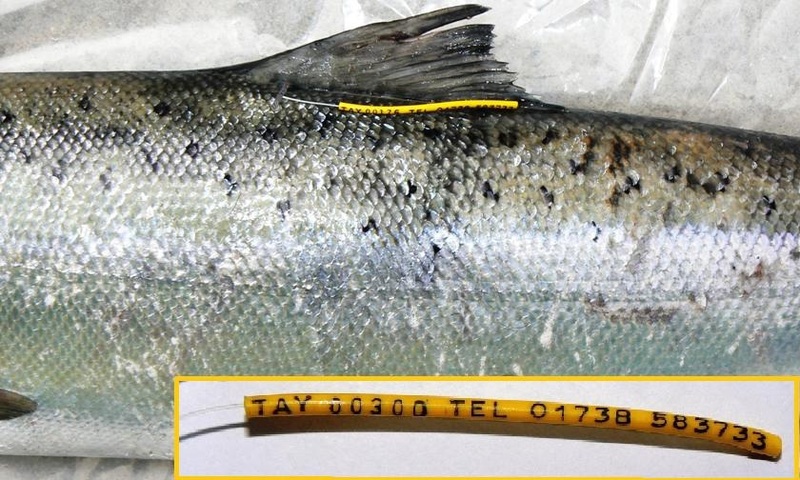 The tags consist of thin yellow plastic tubing attached alongside the dorsal fin on the left side of the fish. Each has a unique number. Any angler reporting a tagged fish will receive a special fishthetay cap as a reward. Key feature of the A.G.M. was the change in leadership of the Association. Jim Perrit of Dunning Angling Club stepped down after 5 years at the helm. His stewardship has seen among other worthwhile projects the creation of the hatchery at Balloch which has generally been seen as vital to the overall state of health of the river. The hatchery is under the charge of John Young of Lochlane And Laggan and currently works to a capacity of around 350000 eggs with some aditional also held at the Tay hatchery at Almondbank. John would like to progress to a sea trout project in the near future. Our thanks go to Jim for all the time and effort he has expended as Chairman. The new Chairman is Colin Lowson of Innerpeffray Fishings and we welcome him on board. Colin outlined his plans to further improve and enhance the already improving salmon and sea trout populations and to increase the membership in order to maintain the cash flow required to finance the many vital programmes planned. His vision is to make the Association more transparent and to communicate better with the membership and the wider angling fraternity. Bob Mitchell of Dupplin Fishings has joined the committee along with Tom Monaghan as an Angler Representative. Regular news and views will appear from now on including an ongoing Chairmans progress report and an overview of the hatchery and general state of health of the river by John Young and Tay District Biologist Rob Mitchell. The AGM will take place on at Crieff Hotel on 20th April. The meeting will open at 1930 hrs and all anglers who have an interest in the Earn are invited to come along and find out what has been happening past, future plans and how to become a member of R.E.I.A.